It wpnld be difficult to trace back to their primitive forms any of the modern tools in most common use; but there are many now living who can recollect the rude and uncouth shapes of many tools as they existed fifty years ago. Could the comparatively rude and clumsy tools of that period be placed side by side with those of the present, perhaps no better illustration could be given of the march of mechanical improvement during the last half century. The screw and nut are among the oldest elements of ma chinesy, mi from their first' introiaettofi, some kind of wrench was required to turn either the nut or tile screw. Probably one of the earliest forms of the screw-head was that now in common use in jack-screws, perforated; the nut being flxed,and the wrench being a simple lever thrust into the perforatifin. It is quite probable also, that the first appliance for turning nuts upen a fixed screw was also a simple lever or bar, thrust into a holo made for the purpose in the nut. In that case, the nut must have been very large and clumsy, and the advantage of a reduction of size, and a different mode of turning it must have soon become apparent. The primitive form of the wrench for square nuts, must be a matter of conjecture, but it was, probably, either that known as the " pot hook " wrench, a bar of iron bent .twice at right angles, or that form which has its jaws parallel to the shaft, or handle, and in which the nut is grasped so that the axis of the handle prolonged wouM pass through the axis of the screw instead- of to one- side as in the Rook wrench. The discovery of the S-wrench might easily have occurred by the accidental bending of the handle, the jaws being theu rendered diagonal to the axis of the lever. Its advantages, once recognized, could hardly have failed to secure it at once the favor with which it has always been regarded. The wrench, having its j aws at right angles with the shank, is also a very convenient form of wrench, and is the parent of the numerous family of adjustable wrenches, known as " monkey wrenches," " screw wrenches," "hammer wreneh-es," etc. All these wrenches have been useful and valued tools in their day and generation. 117 It is only within the last twenty years that any successful attempts at making the S-wrench adjustable have been made. " The original adjustable diagonal, or S-wrench, invented by Wm. Baxter, and patented by him in 1856, is familiar to most mechanics, and therefore needs no description here. It was, if we mistake not, the first wrench of the kind ever patented. It was also described and illustrated by an engraving in our paper about the same time. The inventor did not meet the pecuniary reward for this improvement to which its merits entitled him, as, during nearly the entire term of his patent, he was absent in Mexico superintending important mining and manufacturing enterprises. Upon his return to the United States last spring, his attention was turned to further improvements upon his original device, which resultedin the invention of the entirely novel and practical device illustrated herewith. J The object of the invention is to render the jaws of S-wrenches adjustable, so as to fit different sizes of nuts, at the same time avoiding the clumsiness and unwieldy nature ot the ordinary adjustible hammer and other wrenches, and preserving the proportions which give to the ordinary non-adjustable S-wrench its value in so many instances. By referring to the engraving it will be seen that the wrench consists! essentially of two parts, A and B, mortised and tenoned together, the mortises, D, being formed in the exterior jaws, and? the tenons, C, in the interior jaws of each part. These parts are combined with a right and left hand screw, B, with a thumb piece to operate it, so that by its rotation the jaws.P, are opened'or closed. The plane of movement of the two -parts is in. the direction of the length of the wrench, and at right anglfes to the jaws. Upon the sides of Kke two parts, A and B, in the smaller sizes of the wrench, are scales, S, which, in combination with the screw and thumb piece, B, enable the wrench to be used as a calipers for measuring iron or nuts. It is worthy of notice that the mortises and tenons are farmed upon that side of the division line between the two parts of the divided shank nearest their respective jaws, so that, without increasing the size or amount of metal in the jaws, their strength is preserved while projecting them out from the shank and giving them that bill-like shape, which is requisite to an S-wrench. It will also be observed as an excellent feature that the jaws are so arranged, that when one pair is entirely closed the other pair is open to the maximum, extent to which the closed pair is capable of opening, thus giving the wrench a scope from very small to very large nuts; and also rendering at each adjustment two sizes available to the workman using it. The effect of the right and left hand screw is to give simultaneous and equal movement to each jaw of both pairs to and from each other, obviating so much turning of the thumb piece as is necessary where one jaw is fixed and the other is movable, thus adding to the convenience of the tool in use. The thumb piece is arranged in a recess shown in the engraving, and is entirely out of the way in use, while it is with great facility adjusted-to tka eejnisaJB8B&! of t& worK. The right and left hand screw may be/actuated by a pawl and ratchet, worm and rack, or any other means, but the method shown in the engraving, and herewith described, is much preferred, and is the form adopted by the manufacturers as best adapted to the purpose. The wrench is exceedinglystrong and durable, beingjnade of malleable iron, so manufactured as to approximate in quality to the celebrated Bessemer steel. For further information, address Baxter Wrench Company, 10 Park Place, New York city. Portable Engines With the higher pressure and greater speed at which portable engines are now worked, as compared with the practice of ten years ago, the necessity of lengthening1 the tubes and contracting their diameter should be apparent. The reasons are of the same nature as those which require 11 feet or 12 feet tubes, If inches only in diameter for locomotives. A Wiltshire firm, of some years' standing, has from the first acted upon this obvious view, and their ordinary commercial engines, for they make no " racers," invariably come off first in their class in the Royal Agricultural Society's trials. The long boiler, with correspondingly longer wheel base, gives a steadier engine when working, or when drawn about, and it permits also of a longer connecting rod, thus diminishing the friction on the guide bars. The same firm have for a year or more adopted a form of feed water heater, in which the water is heated by waste steam nearly or quite to the boiling point. Theoretically, this should save upwards of 15 per cent of fuel, and we believe the saving in practice is not less, to say nothing of the lessened wear and tear of the boiler, the admission of cold water doing much injury. An 8-horss engine, working ten hours a day, will burn about 5 cwt. of coal, and at 20s. a ton, a saving of 15 per teent would amount to 4s. 6d. per week, while, also, there would be a further considerable saving in repairs due to the lessened quantity of coal burned. 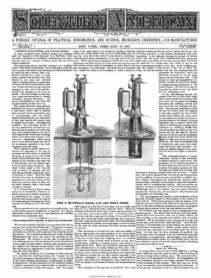 A very few weeks' constant work would thus soon effect a saving at least equal to the cost of any reasonably simple appliance for saving fuel, a f act of which purchasers of portable engines should be sensible when giving orders.—Engineering. [We cannot agree with our London cotemporary. For tubes two inches in diameter it has been found by practice in this country that the length should be not over six feet to insure the best results.—EDS. SCIENTIFIC AMERICAN. THE BoMgh Standard says the great need of the State of North Carolina is "young men who will identify themselves with her interests and destiny—young men who will work— young men of good habits, honest and reliable." The same want is sensibly felt in this city, and we presume many other places are suffering from the same affliction.